NASA’s Juno spacecraft got its first up-close-and-personal view with Jupiter’s Great Red Spot, and the space agency has released photos from the flyby, offering a rare glimpse of the planet’s giant storm. The images add to the wonder of this 10,000-mile-wide storm, at which star gazers have marveled for more than a century. Monday’s flyby marked only the seventh time that Juno has made a close sweep—known as a perijove pass—of Jupiter since the spacecraft began orbiting the solar system’s biggest planet last summer. This perijove pass brought the spacecraft about 5,600 miles above the Great Red Spot’s churning clouds. During these close-ups, the spacecraft’s color camera—called JunoCam—snaps pictures, while its seven scientific instruments gather as much insight as possible about the gas giant’s magnetic fields and atmospheric composition. 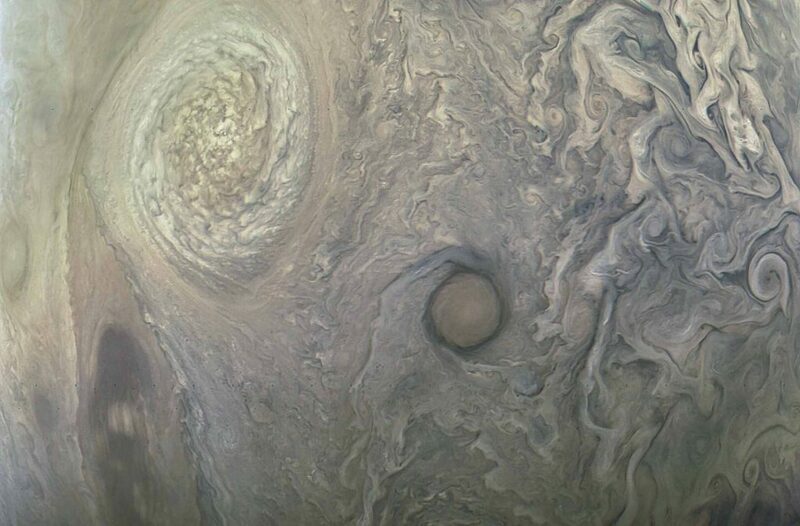 Most of the new photos were processed into gorgeous art-like images by members of the public (NASA encourages citizen scientists to play with the raw photos from JunoCam) but Glenn Orton—a senior research scientist at JPL-Cal Tech—told NewsHour the images also reveal many tantalizing details about the what’s happening in this giant storm. Here’s what he sees in three of the photos. (Editor’s note: These descriptions were edited for brevity and clarity). The colors in this photo are enhanced, so they look richer. But in truth, Jupiter is more pastel. There’s a deep red here—the core of the red spot. We don’t have all the details yet from Juno, but based on Earth-based observations, we suspect those are much higher clouds. Whatever chemistry is taking place in these clouds makes things turn red, due to UV radiation. We think it’s happening there because the clouds are higher in the atmosphere. Surrounding the core, there’s a lot of mottled structures. There are swirls, typically associated with a counterclockwise motion. We know from past observations the wind currents at the center of the Great Red Spot are quite still. Everything around it increases in angular velocity, until you reach a maximum velocity at the edge of the Great Red Spot. If you download the image and blow it up, in the upper right—the 1 o’clock position—there’s a whole bunch of brighter regions and a couple of streaks. Those look like white puffy clouds. I can’t call them thunderstorms, because thunder implies lightning, which we haven’t seen in the red spot, but they’re likely local upwellings. Now, look closely at the 12 o’clock position, right where the red starts to fade to white. There’s a very narrow set of vertical lines: |||||||||||. Those are gravity waves. [Gravity waves happen when a fluid or gas gets disturbed, and gravity pulls it back into a flat, balanced state. Examples include surf at a beach or wavy looking clouds on Earth or Venus]. This set of gravity waves are right along a region where we expect the speed of air rotation is slowing down rapidly. Wind speeds at the center are essentially zero, they build to 290 to 335 miles per hour as you move toward the edge, and then drop to 223 miles per hour at the very edge. Each of those gravity waves is likely tens of kilometers long. The areas in the photo that look black aren’t really black. They’re just slightly less red than everything else. The regions that look darkest are likely deeper clouds in the atmosphere. In the white region that’s south of the red spot, at the bottom of the image, you can see similar mottles of upwellings—tiny bright clouds, where you are beginning to see hints of shadows. We call that the South White Belt region. Those are high clouds, though they are not as high as the Great Red Spot. No one knows yet how deep the clouds in the red spot are, but we’re hopefully getting an answer soon. The processing is doing some artsy work in this one. But it’s interesting because what looks like a stovepipe feature — the curly cue going toward the upper right — is actually the flow of gas going out of the red spot. 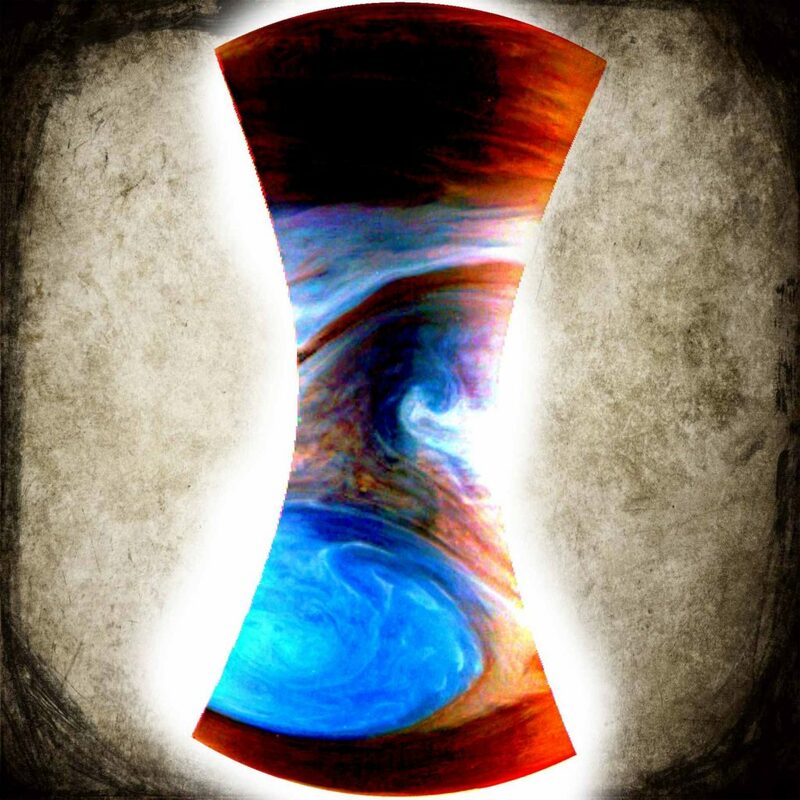 Juno’s microwave radiometer should be able to look deep into the atmosphere, where we expect to see an enhancement in ammonia levels over the Great Red Spot. We’re hoping to answer the question of how deep the ammonia is, which could be an indication of how deep the general wind circulation of Jupiter goes. 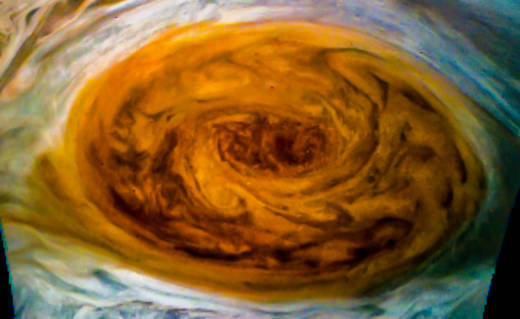 There are competing theories about the winds of Jupiter. Some say all the action happens toward the outside of the planet, the outer few kilometers or so. Others argue the winds actually go really deep, and create columns from one latitude in the north to the same latitude in the south, like big cylinders. Microwave radiometer measurements from the previous flybys have had mixed answers to that question so far. At the equator and just north of the equator, the turbulence goes immensely deep. There’s this huge plume, with a very concentrated ammonia level, coming from very deep in the atmosphere. But at higher latitudes toward the north and south poles, this turbulence doesn’t go as deep. What we see at the Great Red Spot will tell us what camp the mid-latitudes fall into and that’s really interesting. This photo isn’t taken from the Great Red Spot. It’s much higher in latitude in the north. But in the upper left, you can see a small anti-cyclone that has been changing colors recently. It’s typically white, but it’s been turning pink, then red and then back again. We’re trying to track this color change with readings in other wavelengths to determine how high things are in the atmosphere and whether these shifts are due to elevation. To the right, there’s another cyclone or anti-cyclone. Here, there are darker circles, with relatively light stuff on the outside. We don’t know what that is. On the far right, you can see really turbulent and chaotic stuff. It’s an upwelling that’s been going on for sometime in the north. These types of turbulence happen from time to time, and we’re not quite sure why.